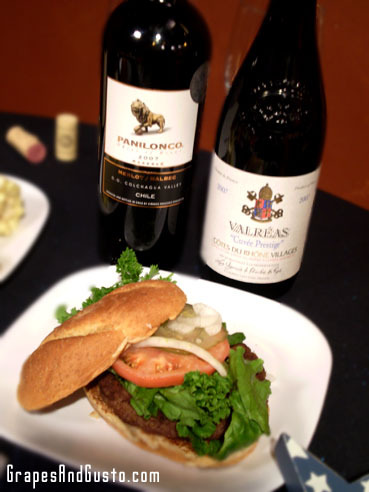 Get out of auto-pilot mode and reach for a non-Cabernet with your burger. There is something primal and so satisfying about the classic, hearty combination of “reds with reds.” And for summer, this hot match can still sizzle: imagine a meaty, iron-rich burger in one hand, with juices dripping down your wrist, and in the other hand, perfectly poised, a glass of robust red wine to match. Just when you thought things could not get better—oh yes, they can. When beef comes to mind, the first red wine that is often on our lips (oh no, more puns!) is a hearty Cabernet Sauvignon. Nothing wrong with that. However, with summer here, I suspect that even those who love wool suits in the winter don a different outfit when the mercury rises into sweaty territory. Well, our palates are no less seasonal. How about lightening things up in the red wine department, and getting out of auto-pilot selections, for a change? Those juicy burgers on the grill would sure love to have a summer fling with some Southern Rhône wines, such as those from Chateauneuf-du-Pape, made from up to 13 different types of grapes (though usually a primary blend of Grenache, Mourvedre, and sometimes Syrah). Northern Rhone rules the roost when it comes to Syrah, such as wines from the well-regarded Cotes-Rotie (“Roasted Coast”) and Hermitage; these are Syrah wines made in the elegant “Old World” style. However, bold, drippy burgers are often most at home with equally spunky wines, and in this case, I would recommend a high-energy Shiraz from Australia. (That is NOT to say that all Australian Shirazes are the same, either, though that is for another day’s discussion…). Of course, Cotes-du-Rhône spans a bit of the region and you can find some great values from there (see examples below). Speaking of toppings for burgers, what’s a great cheeseburger wine? A great red sipper – big enough to stand up to a bulky cheeseburger, but smooth enough to sip solo while waiting for the food to be ready – is a jammy Malbec; serious plum and blackberry but without as much tannic gravel going on as the biggest of reds. Envision the curvy silhouette of a lima-bean shaped pool instead of a hard-edged Olympic-sized square – the former is more rounded, but a real pool nonetheless. Merlot, particularly when blended (with Malbec, even), can offer background structure but enough softness to highlight interesting toppings on the burgers without competing for primary flavor status; finally, it is always fun to open up a bottle of Beaujolais, such as Beaujolais-Villages (not to be confused with the annual Beaujolais Nouveau, which comes out in November, and would be quite the anachronism here). While designed not to be a big, over-the-top wine, Beaujolais wines are made of the Gamay grape and are often crafted in a manner that guides and slides the wine into our glass and into our throats without too much fuss. And that, my friends, is what summer is all about, is it not? This post is part of a series of “Picnic Pairings” for summer food and wine. Check out the first series post here. Good examples: Jaboulet Cotes-du-Rhône Parallelle 45 2007 (Rhône, France, $12); Layer Cake Shiraz 2008 (Barossa Valley, Australia, $17); Louis Jadot Beaujolais-Villages 2007 (Beaujolais (multi-village), France, $14). Extreme value pick: Panilonco Merlot-Malbec (Colchagua, Chile, $4).